The project ‘Mossel netten West 6’ involved the positioning of 56 large anchoring rods on the seabed. The project was located in the inland sea called ‘de Waddenzee’. 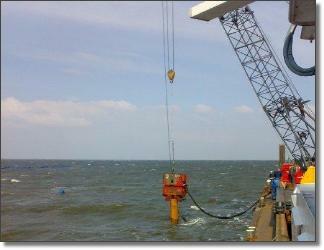 Our client has been assigned a special area of the Waddenzee of 1400 by 200 meters. This area is reserved for the breeding of Blue Mussels in a specially developed netting construction. This netting construction is connected to the network of 56 anchoring rods. 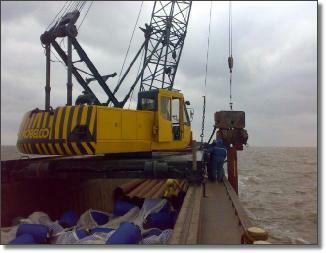 The craneship MV ‘Leendert’, owned and operated by Tijsterman Waterwerken from Koog aan de Zaan was used for the entire project. Our first step in the project was to design a CAD drawing to determine how and where the anchor rods should be placed. Together with our client we devised a layout in which we made optimal use of the designated area. This plan was imported into the Viking Navigation system as seen in figure 3. We made use of a Hemisphere GPS VS110 DGPS receiver with built in GPS compass for use in the wheel house. An Hemisphere GPS R110 DGPS receiver was installed on the crane itself, with its antenna installed in the top of the cranes boom. As always we made use of heavy duty PC’s and special LCD’s in a solid metal housing and a protective and tough glass filter. We used special miniature PC’s which are very suitable in places where there is not much room to spare. 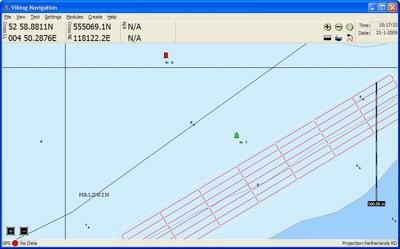 Two copies of our Viking navigation software were functioning on the ship for this project, in the wheel house and in the crane itself. Using this set up both the ships captain and the crane driver had a real time view of the ongoing navigational process.